Sprays water 7' high and 22' wide, moving up to 600gpm. 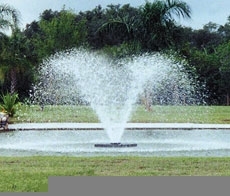 Adjustable trumpet-shaped spray is designed to put oxygen back into the water Designed for continuous operation on ponds of 1/4-acre or larger. 32" minimum depth required.